Samsung are well-known for their Galaxy range of smartphones and tablets, and somewhat less well known for their NX range of WiFi-enabled mirrorless interchangeable-lens cameras. 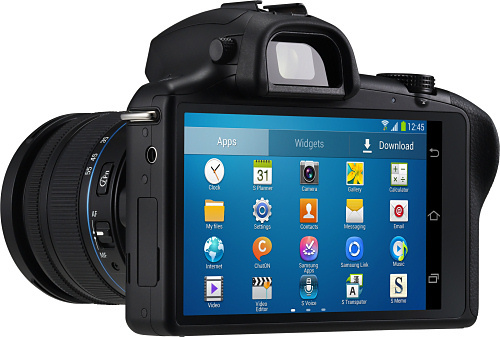 The Samsung Galaxy NX is what happens when you combine the two things together. We've seen a few similar devices from Samsung before, notably the recently announced Samsung Galaxy Zoom, but where the Zoom is a compact digital camera, the NX is a fully-fledged device with a 20.3 effective megapixel APS-C CMOS sensor that comes with a variety of lenses and a pop-up flash, delivering the sort of image quality that only a high-end professional camera could beat. 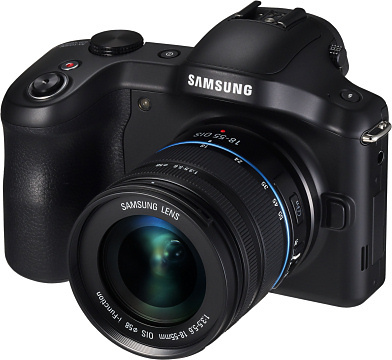 Unlike most camera phones, the Galaxy NX can save RAW format uncompressed image files as well as more standard JPEGs. Video capture capabilities are also good with 1080p recording at 25 fps and 720p recording at 50 fps, plus various other modes. The Galaxy NX can even record short animated GIFs, and take stills pictures with an embedded audio clip. Underneath it all is an Android 4.2 tablet with a 1.6GHz quad-core CPU, 2GB of RAM, 16GB of flash storage plus a microSD slot and WiFi, Bluetooth and 3.5G and optional 4G connectivity. On the back is a 4.8" HD display, although Samsung have not confirmed the resolution we suspect it is a 1280 x 720 pixel panel, in addition there is a small SVGA (800 x 600 pixel) electronic viewfinder (EVF). There are no voice capabilities on the Galaxy NX, but you can upload photos and video clips directly over a cellular network or WiFi without having to muck around with transferring them to a PC. With the standard 4360 mAh battery inside, the Galaxy NX weighs a hefty 495 grams. The footprint is 137 x 101 mm with the thickness dictated by the type of lens you are using. You're not going to be able to carry this in your trouser pockets without arousing suspicion, but it will save a lot of mucking around if you want to do a bit of image editing before uploading your picture to Flickr. Along with the usual Android features is something called Photo Suggest which looks at your location with GPS and suggests things that you might like to take a photograph of. There are also lots of applications for fiddling with your pictures, but probably one thing to beware of is using up all your cellular data plan.